We won a prize at @RomeoTheCat’s #pawpawty celebrating @BrewskieButt’s birthday. It was donated by @flicka47, who also generously donated treats to @KittenRescue. We were super excited when such a great smelling box arrived at the door. @MisterPeabody picked it up and brought it inside. 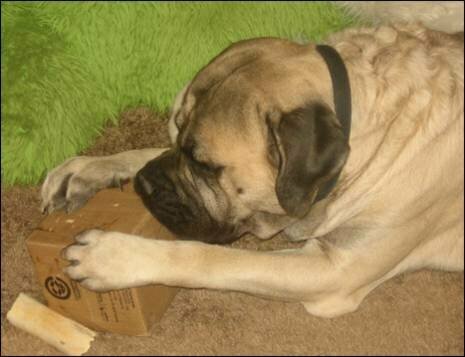 Here are some photos of us opening the box and enjoying our treats! You are all adorable! 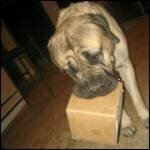 Go Mister Peabody and get that box – you’re so sweet bringing in the mail and then making sure the mail is in a million pieces for easy disposal of the box. I am so glad that you liked them & enjoyed them SOOoo much(box included! )!